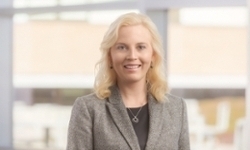 UNMC › Pathology and Microbiology › Faculty › Bios › Allison Cushman-Vokoun M.D., Ph.D.
Two cases of Mazabraud syndrome and identification of a GNAS R201H mutation by next-generation sequencing. Cox JL, Cushman-Vokoun AM, McGarry SV, Kozel JA. Virchows Arch. 2017 Mar 3. doi: 10.1007/s00428-017-2100-8. [Epub ahead of print] No abstract available. QIAGEN Therascreen KRAS RGQ Assay, QIAGEN KRAS Pyro Assay, and Dideoxy Sequencing for Clinical Laboratory Analysis of KRAS Mutations in Tumor Specimens. Alqahtani QM, Crowley A, Rapp S, Cushman-Vokoun AM. Lab Med. 2016 Feb;47(1):30-8. doi: 10.1093/labmed/lmv009. Standards for Clinical Grade Genomic Databases. Yohe SL, Carter AB, Pfeifer JD, Crawford JM, Cushman-Vokoun A, Caughron S, Leonard DG. Arch Pathol Lab Med. 2015 Nov;139(11):1400-12. doi: 10.5858/arpa.2014-0568-CP. Clinical utility of KRAS and BRAF mutations in a cohort of patients with colorectal neoplasms submitted for microsatellite instability testing. Cushman-Vokoun AM, Stover DG, Zhao Z, Koehler EA, Berlin JD, Vnencak-Jones CL. Clin Colorectal Cancer. 2013 Sep;12(3):168-78. doi: 10.1016/j.clcc.2013.04.005. Comparison study of the performance of the QIAGEN EGFR RGQ and EGFR pyro assays for mutation analysis in non-small cell lung cancer. Cushman-Vokoun AM, Crowley AM, Rapp SA, Greiner TC. Am J Clin Pathol. 2013 Jul;140(1):7-19. doi: 10.1309/AJCPMF26ABEOYCHZ. Molecular diagnostics of soft tissue tumors. Bridge JA, Cushman-Vokoun AM. Arch Pathol Lab Med. 2011 May;135(5):588-601. doi: 10.1043/2010-0594-RAIR.1. Review. Assay design affects the interpretation of T-cell receptor gamma gene rearrangements: comparison of the performance of a one-tube assay with the BIOMED-2-based TCRG gene clonality assay. Cushman-Vokoun AM, Connealy S, Greiner TC. J Mol Diagn. 2010 Nov;12(6):787-96. doi:10.2353/jmoldx.2010.090183.